Christian McCaffrey (DK – $9,300/FD – $9,100): McCaffrey has been charging on the rail over the last five weeks leading to four impact games (32.70, 36.80, 46.70, and 31.10 Fantasy points). Over this span, Christian has 803 combined yards with eight TDs and 36 catches which comes to 160 yards, 1.6 TDs, and seven catches per game. He’s now on pace for 2,000+ yards with 15+ TDs and 100+ catches. The Browns rank 26th defending RBs (2,077 combined yards with 15 TDs and 61 catches) with disaster in four games (PIT – 200 combined yards with two TDs and five catches, LAC – 270 combined yards with three TDs and three catches, PIT – 242 combined yards with two TDs and seven catches and seven catches, and KC – 240 combined yards with three TDs and five catches). The Panthers have had McCaffrey on the field for all but five plays over the last seven games. Elite opportunity with a huge floor and favorable matchup with his explosiveness tied to his TD production. Ezekiel Elliott (DK – $8,600/FD – $8,800): Elliott has over 100 combined yards in his last five games (112, 186, 201, 143, and 136) with five TDs and 38 catches while averaging 27.2 touches. He’s trailing the top RBs in TDs (9) while showing growth in the passing game. Ezekiel should gain 2,000 yards with 12+ TDs and 70+ catches while having a favorable schedule down the stretch. In Week 10, he beat the Eagles with his 187 combined yards, two TDs, and six catches. Philly struggled to defend RBs in three of their last four games (39.90, 40.10, and 39.40 Fantasy points) pushing them down to 15th in RB Fantasy defense (1,673 combined yards with 12 TDs and 75 catches). The direction of Dallas’ offensively and the fade of the Eagles’ defense points to another game with 30+ Fantasy points as long as Dak Prescott doesn’t steal his TDs. Alvin Kamara (DK – $8,100/FD – $8,300): Kamara has become more of a Fantasy wild card with Mark Ingram back on the field. Over the first four games, Alvin had three impact games (43.10, 34.00, and 41.10 Fantasy points), but he came up short in his last three outings (17.80, 10.80, and 15.20). Alvin is on pace to set career highs in combined yards (1,730), TDs (20), and catches (87). In Week 1, he beat Tampa for 141 combined yards with three TDs and nine catches in a chaser game. The Bucs allow the 5th most Fantasy points to RBs (1,856 combined yards with 19 TDs and 67 catches). Tampa has disaster risk vs. RBs, but Kamara remains in a split for touches. His projections came out high which are dependent on him scoring multiple TDs with a high opportunity in the passing game. I’ll give him the green tag based on matchup while understanding his floor has much more risk than the top three RBs on the Sunday slate. Aaron Jones (DK – $7,200/FD – $7,500): Jones struggled to get rolling in the run game (11/36/1) in Week 13 with minimal value in the passing game (4/16) while seeing Jamaal Williams seeing the most playing time (50 percent of the RB snaps) since Week 2. Over the last six games, Jones gained 591 combined yards with seven TDs and 19 catches. The Falcons rank 30th defending RBs (2,022 combined yards with 15 TDs and 93 catches). Based on salary, Jones should be an attractive option. His matchup points to upside especially if Green Bay takes his potential edge in the passing game. Possible 100+ yards rushing with at least one TD, but he’ll need another eight to ten Fantasy points in the passing game to match the elite RBs in Week 14. Austin Ekeler (DK – $6,200/FD – $6,700): I don’t think there is any chance that Melvin Gordon plays this week. The Chargers don’t need him to beat the fading Bengals. Last week Ekeler struggled to find running room (13/21) while looking rather boring in the passing game (5/22). LA had him on the field for 78 percent of their RB snaps, but the fourth quarter success of Justin Jackson will command more chances. On the year, Austin averages 5.2 yards per rush and 10.2 yards per catch with a nice floor in catches (37) and some scoring ability (four TDs). The Bengals allow the most Fantasy points to RBs (2,170 combined yards with 19 TDs and 66 catches). Four teams have over 200 yards rushing against Cinci with each of those games resulting in two TDs or more. His Week 13 resume will scare many Fantasy owners away especially when adding in the Justin Jackson factor, but Ekeler is the best value at RB. The Chargers’ RBs could very well score 50+ Fantasy points in PPR leagues. Pretty much Melvin Gordon with a 30 percent discount in price. Tevin Coleman (DK – $4,400/FD – $6,100): Since his impact game in Week 9 (156 combined yards with two TDs and five catches), Coleman gained only 182 combined yards with one TD and ten catches while averaging under 11 touches per game. The Falcons did play against three teams (DAL, NO, and BAL) that play well vs. the run over the last three weeks. This season Tevin has seven TDs while ranking 18th in RB scoring in PPR leagues. The Packers are 13th in the league vs. RBs (1,832 combined yards with 14 TDs and 51 catches). They allow 4.6 yards per rush with four teams rushing for over 150 yards against them. Appears to be roadkill in the Fantasy games after his poor results over the last two weeks (14 rushes for 14 yards), but he does have explosiveness if he breaks into the second level of the defense. Coleman also can score TDs in the red zone. Green Bay will rush the QB, which will create some open field in the passing game if Matt Ryan chooses to feature his RBs in Week 14. His salary is favorable for his potential upside. I feel a bounce-back game that may land him on some big tickets this week. Justin Jackson (DK – $3,800/FD – $4,500): After riding Austin Ekeler into the ground for three quarters, the Chargers gave Jackson a ride in the fourth quarter vs. the Steelers. He responded with 82 combined yards with a TD and one catch on nine touches while being on the field for only 14 of 64 plays run by LA. Justin had four productive seasons at Northwestern where he gained over 1,350 yards in each year with 42 TDs and 122 catches). His flashed vision on a couple of his runs, which led to a TD and another big play. This week the Chargers will give him more chances especially with Cinci struggling to defend the run and the Chargers being big favorites in the game. His value should be high in the second half while earning at least one TD. I don’t expect Ekeler to roll over and hand him the keys to the top RB snaps, but the RB2 in this offense has been productive in many games in 2018. Live option at this salary level. Jaylen Samuels (DK – $3,800/FD – $4,600): With James Conner out this week for the Steelers, Samuel will be the next man up at the running back position in Pittsburgh. Jaylen comes with a high-value pass catching pedigree (65/597/7, 55/565/7, and 76/597/4) over his last three seasons at NC State while seeing limited action on early downs (165/961), but he did show value in rushing TDs (27). Pittsburgh will rotate two backs this week while Samuel will get the key components (TDs and catches). The Raiders ranks 21st defending RBs (2,064 combined yards with 12 TDs and 40 catches). An excellent matchup with a floor of 70+ yards with a TD and 4+ catches. Nick Chubb (DK – $6,700/FD – $7,700): Over the last six games with starting snaps, Chubb gained 654 combined yards with seven TDs and 12 catches while averaging 21.2 touches per game. His floor in catches rose to three over his last three games, but game score did lead to him only seeing only 47 percent of the RB snaps in Week 13 in a chaser game. The Panthers have the fifth best RB defense (1,294 combined yards with ten TDs and 49 catches). Explosive runner, but this isn’t a great matchup when you add in his much higher salary. I expect a TD with mid-teen points while being a much lower own this week in the daily games. 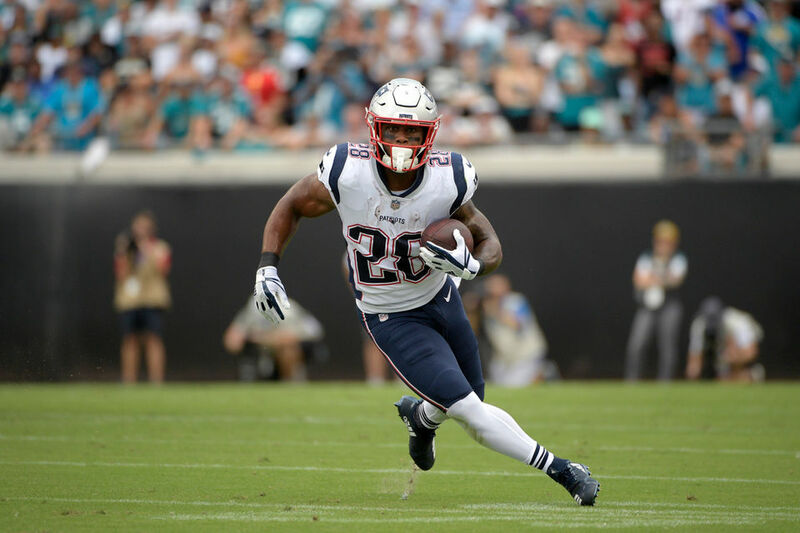 James White (DK –$6,600/FD – $7,200): White had a rebound in value in Week 13 (118 combined yards with seven catches), but he failed to score a TD for the third straight game. The Patriots had him on the field for 45 percent of their RB plays compared to 41 percent by Sony Michel, and 23 percent by Rex Burkhead. His opportunity for rushing TDs will be minimal going forward while his best value will come in a chaser game. James is the 8th highest scoring RB in PPR leagues, but 26th over the last three weeks. RBs have 66 catches for 624 yards and three TDs against Miami with no passing TDs allowed to RBs over the last seven games. In Week 4, White had 112 combined yards with two TDs and eight catches against the Dolphins. Overpriced for his recent opportunity while needing game flow to work his way even to produce a steady game. Joe Mixon (DK – $6,400/FD – $7,000): Mixon is the 13th highest scoring RB in 2018 despite missing two games. Over last four games with the Bengals fading badly on defense, Joe averaged only 12 touches per game with one TD with some value in the passing game (14/141). On the year, he has four games with over 100 combined yards (149, 115, 138, and 155) and six TDs. The Bengals had Giovani on the field for about 40 percent of the RB snaps over the last three weeks to lower Mixon’s opportunity. The Chargers are 18th defending RBs (1,783 combined yards with ten TDs and 74 catches). Over the last eight games, LA allowed two TDs or fewer in six games. Tough to trust in the daily games with a backup QB starting plus Cinci continues to play without their top WR. Josh Adams (DK – $5,300/FD – $6,400): Over the last three games, Adams gained 241 combined yards with two TDs and three catches on 17.3 touches per game. The Eagles had him on the field for 57 percent of their plays over this period while rotating in two other backs in Week 13. The Cowboys held RBs to 20.0 Fantasy points or fewer in each of their last four games. Dallas ranks 8th vs. the RB position (1.419 combined yards with eight TDs and 76 catches). Only an early down runner for a team that scores less than one rushing TD per game. Fade for me at this salary level. Spencer Ware (DK – $5,200/FD – $6,400): In his first start in 2018, Ware gained 52 combined yards with one TD and one catch on 15 touches while receiving 69 percent of the RB snaps in Kansas City. Spencer looks to have two-thirds of the RB opportunity in this offense. This year the Chiefs’ RBs gained 1,860 combined yards with 17 TDs and 52 catches or 28.3 Fantasy points per game. The Ravens have the best RB defense (1,156 yards with eight TDs and 51 catches) with one team scoring having a good game (PIT – 165 combined yards with one TD and seven catches). KC will score TDs from the RB position and Ware is the option best positioned to have success. Don’t dismiss based on last week and his perceived matchup as a goal-line TD with added to some catches gives him an outside chance at being viable at this level while being a lower percentage own. Marlon Mack (DK – $4,600/FD – $6,500): After suffering a mild concussion in Week 12, Mack struggled to make an impact last week against the Jaguars (33 combined yards with one catch) while being on the field for only 37 percent of the plays run by Indy. The game was close, but the Colts chose to ride Nyheim Hines to help the passing game (9/50 on nine targets). Over the seven previous games, Marlon gained 637 yards with five TDs and 11 catches on 118 touches (16.9 per game). Houston is 9th in the NFL defending the RB position (1,402 combined yards with 11 TDs and 71 catches) with three teams barely scoring over 30.0 Fantasy points (NE – 33.80, IND – 30.30, and MIA – 30.80). The Texans allow 3.8 yards per rush. Luck will use his RBs in the passing game this week, but Mack may not be the best option for success. Not ideal on the road. Gus Edwards (DK – $4,500/FD – $6,400): Fantasy owners had trust issues with Edwards last week due to his cloudy ankle issue. He finished with 21 rushes for 82 yards with 51 percent of the RB snaps. Over the last three games in favorable matchups, Gus gained 315 yards on the ground on 61 carries with one TD. The Chiefs allow the second-most Fantasy points to RBs (2,178 combined yards with 16 TDs and 83 catches). I fully expect one more rushing TDs by Baltimore, but Lamar Jackson is more of a favorite to score in close. If game score gets out of line and the Ravens need to throw, Edwards will be on the sidelines on many plays. More risk reward even a favorable RB matchup due to his emptiness in the passing game. Jalen Richard (DK – $4,100/FD – $4,800): Richard flashed twice over the last three weeks as a runner (11/61 and 6/95), but the Raiders have given him two rushes or fewer in eight of their 12 games. His best value comes in the passing game (56/478 on 67 targets) when Oakland falls behind early. Jalen doesn’t have a TD in 2018. This year RBs have 47 catches for 325 yards and four TDs on 67 targets against the Steelers. Game flow should point in his direction, but Pittsburgh will rush the QB while doing a good job defending RBs in the passing game. Doug Martin (DK – $4,300/FD – $6,000): Last week Martin had a season-high 20 touches, which led to 67 combined yards with a TD and two catches. As the lead runner for the Raiders over the last six games, he gained 447 yards with two TDs and 12 catches on 90 touches (15 per game). The Steelers have worked their way to 7th in RB defense with ball carriers gaining 4.2 yards per carry with nine rushing TDs. The lack of offense in Oakland will lead to minimal upside in rushing yards for Martin. Boring smell with emptiness expected. Nyheim Hines (DK – $4,200/FD – $5,100): Hines had a productive showing last week in the passing game (9/50), which came after catching three balls or fewer in his previous six games with Indy featuring Marlon Mack in most games. In Week 4, Nyheim had the best game of his career against the Texans (73 combined yards with nine catches and two TDs). This season Hines has four games with seven catches or more, but he hasn’t scored since his game against Houston. Only a flier if the Colts need to chase in the scoreboard in Week 14. Saquon Barkley (DK – $8,900/FD – $8,900): Barkley is on a similar pace as Christian McCaffrey in combined yards (2,000+), TDs (16), and catches (99+ catches), but the Giants have scored only 25 offensive TDs compared to the Panthers (36) while falling well below the TD production of the Rams (47) and the Chiefs (54). Saquon averages 23.8 touches per game with three impact games (37.90, 35.20, and 33.20) over the last seven games. Washington held him to 111 combined yards with nine catches in their first matchup in New York. The Redskins are 11th in the league vs. the RB position (1,619 combined yards with ten TDs and 73 catches). Over the last five games, Washington started to show more risk on defense (38, 3, 23, 31, and 28 points allowed) with ball carriers earning 30+ rushes in each of their last three games. The downgrade at QB in D.C. invites more volume of chances for Saquon. Solid option, but he still needs Eli to stay upright in the pocket (seven sacks in the first matchup with the Redskins). Great player with a slightly below par matchup. David Johnson (DK – $6,500/FD – $7,000): Johnson finished with a short game (72 combined yards with one catch) in Week 13 while being sniped for some upside by Chase Edmonds (66 combined yards with two TDs and two catches) who had the best game of his career by a wide margin. Over the last month, David gained 488 combined yards with two TDs and 11 catches). He slipped to 12th in RB scoring in PPR leagues after big games by Tarik Cohen and Phillip Lindsay. The Lions sit 25th defending RBs (1,917 combined yards with 13 TDs and 65 catches) with five teams scoring over 30.0 Fantasy points scoring over 30.0 Fantasy points from the RB position. Winning matchup, but I can’t trust that the Cardinals will create enough offense or scoring plays to use in the daily games. Phillip Lindsay (DK – $6,300/FD – $7,900): Lindsay shined in his last three games (106 combined yards with two TDs and four catches, 14/110/1, and 19/157/2) pushing him to 11th in RB scoring in PPR leagues. Over the last seven games, Phillip has 723 combined yards with seven TDs and 17 catches on 16.3 touches per game. Even with his success, Denver continues to rotate in two other RBs. Last week Lindsay was on the field for 42 percent of the RB snaps, which was his lowest total since Week 6. San Fran is 19th in the NFL defending the RB position (1,752 combined yards with 12 TDs and 70 catches). A decent matchup, but his much higher salary paired with questionable opportunity in snaps would push me elsewhere for RB upside. Sony Michel (DK – $5,900/FD – $6,900): Sony finished Week 13 with a flat game (70 combined yards with a catch on 18 touches) while the coaching staff cost him a couple of goal-line chances when they turned to fullback James Develin for a couple of short-yardage TDs. In his best five games with four coming at home, Sony gained 533 combined yards with five TDs and three catches while averaging 22 touches per game. Rex Burkhead will steal some touches and possibly more goal line TDs. Miami ranks 27th defending RBs with rushers gaining 5.0 yards per carry with ten rushing TDs. A reasonable chance at a TD with a mid-teen Fantasy score expected. Seems overpriced based on his competition for playing. Not that far off his salary bucket if he scores two TDs. Mark Ingram (DK – $5,700/FD – $6,600): Ingram struggled to get rolling in Week 13 (28 combined yards with two catches on eight touches) against the Cowboys, which was more of a team problem. His success over eight games projected over a full season would come to 1,204 combined yards with ten TDs and 30 catches. The Saints tend to have him on the field for about 43 percent of their plays leading to 14 touches per game. Tampa has risk against RBs, which gives him upside if he hits on the scoring plays to a long run or two. Chris Thompson (DK – $5,700/FD – $5,600): Thompson was overrated last week as the Redskins barely looked his way in the passing game (3/18 on five targets) despite trailing and Chris being on the field for 64 percent of the RB play run by the Redskins. His playing time was in line with Week 2 (68 percent) and Week 4 (66 percent) while offering minimal value on early downs (three carries for three yards last week). RBs have 65 catches for 539 yards and five TDs on 88 targets against the Giants. Possible TD, but game flow is the key to his opportunity in the passing game, and Adrian Peterson isn’t going to go away. Lamar Miller (DK – $5,100/FD – $6,500): Miller played his best ball of the season over the last six weeks (670 combined yards with three TDs and eight catches) while averaging 18.5 touches per game. In Week 4, he gained only 49 yards on 14 carries against the Colts on the road. Indy is 20th defending RBs (1,810 combined yards with ten TDs and 89 catches). His matchup points to value in the passing game, but the Texans don’t feature their RBs in the passing game (33/286/1 on 47 targets). Playing well with limited upside in scoring and pass catching ability does paint a lower ceiling even in a game that should offer some upside. One dart should do here. LeSean McCoy (DK – $5,000/FD – $5,700): After 13 weeks of the NFL season, McCoy only has one game of value (118 combined yards with two TDs and one catch) which came against the Jets. LeSean doesn’t have any other TDs while averaging 15.6 touches per game. The Jets are league average against RBs (1,800 combined yards with 13 TDs and 57 catches). Over the last three games, New York allowed over 200 yards rushing in two games with RBs scoring three TDs. Plenty of failure risk, but McCoy does play better at home while the Jets continue to fade on defense (21 TDs allowed over the last seven games). They key here is Josh Allen not stealing the rushing TDs. May surprise while the faint of heart will look elsewhere for upside. Adrian Peterson (DK – $4,800/FD – $6,500): Last week Peterson hit on a 90-yard TD, but his other eight carries led to only eight yards. Adrian has over 100 yards rushing in two games (19/120/2 and 26/149/1) with the second outing coming against the Giants. He averages 17.3 touches per game with eight TDs. New York slipped to 24th in RB Fantasy defense with two diaster showings (NO – 222 combined yards with three TDs and six catches and CHI – 290 combined yards with one TD and 14 catches). Volume RB who now has more risk for touches with Chris Thompson back on the field. Grinder back who needs over 100 yards rushing with one TD to be in play. My bet is on the under even with this matchup offering upside on early downs. Theo Riddick (DK – $4,700/FD – $5,400): Riddick has 244 combined yards with no TDs and 28 catches over the last five games. Last week he had a season-high eight rushed for 32 yards while leading the Lions in RB snaps (53 percent). RBs have 63 catches for 522 yards and two TDs on 76 targets against the Cardinals with three teams (WAS – 8/133/1, SF – 11/108/1, and LAC – 12/73) having success in the passing game from the RB position. Theo has a chance to be active in the passing game, but he’ll need a TD to be a reasonable option at this level. Kenyan Drake (DK – $4,500/FD – $6,300): Drake entered last week’s game with concerns with a shoulder issue (same this week). He was able to play on 55 percent of the Dolphins’ snaps, which was his highest total since Week 8. Even with a bump in playing time, Kenyan gained only 44 yards with one TD and two catches on nine touches. Over the last six games, Drake has six TDs while failing to gain over 100 combined yards in any game. Drake averages 12.2 touches per game. RBs have 78 catches for 626 yards and three TDs on 104 targets against the Patriots. His pass catching upside in a chaser game added to his ability to hit on a long run gives him a chance this week if Miami falls behind early. Coin flip who will be a low percentage play. Jeff Wilson (DK – $3,800/FD – $5,600): With Matt Breida out this week, Wilson will get the start for the 49ers. After spending 11 weeks on San Fran’s practice squad, Jeff picked up 31 touches over the last two weeks leading to 175 combined yards with nine catches. In his best season at North Texas in college in 2017, Wilson gained 1,383 combined yards with 16 TDs and 24 catches. He has some pass catching ability highlight by his Week 14 game (8/73) with scoring ability (31 TDs in his last two seasons in college). In 2018, the 49ers RBs gain 4.9 yards per rush with nine TDs. Denver is league average defending the RB position (1,839 combined yards with nine TDs and 60 catches). The Broncos haven’t allowed a rushing TD in six games while picking up 27 sacks in their last seven contests. Very tempting after his relief showing last week, but I sense a TD-less game leaving him short of an impact play at this level. Worth a swing or two in GPP contests due to his salary cap relief.